SUPERIOR FORMULATION - Our eye serum is unlike any eye cream on the market. Most eye creams are thick, oily and take forever to be absorbed into the skin. We have formulated our eye serum to be lightweight with a plush and silky texture. It is easily absorbed into the skin and dries instantaneously leaving your eyes literally revitalized as have added caffeine to provide instant relief for the feeling of heavy and tired eyes. DIMINISHES DARK CIRCLES, PUFFINESS AND SWOLLEN EYES - Infused with powerful and proven antioxidants, such as Hesperidin Methyl Chalcone, Alpha Bisabolol, Vitamin C + B3 and Caffeine, specifically targeted to reduce dark circles under the eyes and treat puffy and swollen eyes. HYALURONIC ACID IS WIDELY KNOWN AS THE "FOUNTAIN OF YOUTH"! 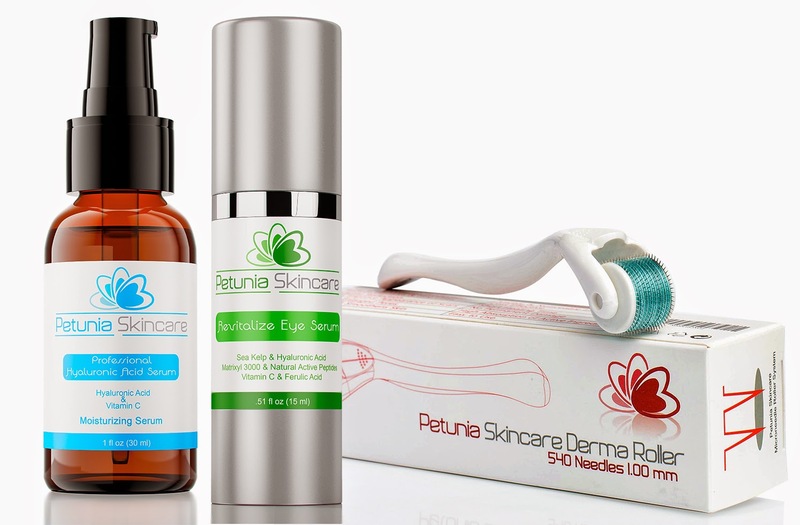 Petunia Skincare's Professional Hyaluronic Acid Serum, made with the highest quality vegan-free and cruelly-free hyaluronic acid, is the ultimate anti aging and anti wrinkle solution to give you that dewy, elastic, and youthful boost in your skin. Hyaluronic acid binds moisture and water into your skin to help you achieve plump, soft, and tight skin. Fine lines, crows feet and wrinkles are filled in. OUR SERUM WORKS! As we age, the hyaluronic acid content in our body naturally decreases, and as a result we must build more hyaluronic acid back into the body either through orally or topically. Our serum has been tested thoroughly and has been proven to stimulate the production of hyaluronic acid and collagen. PREMIUM FORMULATION! Hyaluronic acid is the key ingredient in this serum, and we have combined two very important antioxidants: Vitamin C, and Ferulic Acid into our formulation. Hyaluronic acid is responsible for retaining moisture giving you skin's youthful elasticity and plumpness by trapping water in your skin. Vitamin C helps prevent aging of the skin by speeding cell regeneration, repairing free radical damage, and stimulating collagen. Ferulic acid protects the skin by neutralizing free radicals from UVA/UVB rays which would otherwise cause premature aging in the skin.